In my opinion, trying to get open is one of the most enjoyable parts of the game of basketball. The fast break should be performed with speed; players need to pass the ball quickly up the floor before the defense can recover. The three keys to rebounding are positioning, boxing out, and using your leverage. The school is making a financial and educational commitment to you, and that commitment is a two-way street. 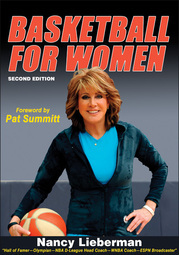 In Basketball for Women, Nancy Lieberman shares skills and tips that allowed her to reach the pinnacle of the sport. This new edition covers shooting technique, defense, passing, and training. Nancy includes examples of her experience as a player, coach, and broadcaster to demonstrate how becoming a complete player affects the game.